BNP Paribas (Suisse) SA is in a three-year partnership with sustainable development organization Raleigh International. 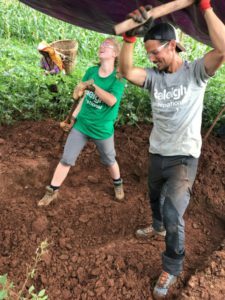 Thanks to this collaboration, employees of the bank have the chance to go on volunteering mission in Nepal to work on Raleigh’s Water and Sanitation programs. Two managers of the bank, Leila and Dimitri, left for eight weeks to take part in these missions as Project Managers, one in Quireni community and the other in Gaucharan community. They led groups of international young volunteers to deliver the WASH programme. Leila and Dimitri participated to the WASH (Water, Sanitation and Hygiene) project conducted in Nepal and supported by BNP Paribas in Switzerland. WASH is first about working hand in hand with the local communities to make their water facilities more sustainable, but also about raising awareness for general hygiene. Contribution to the social, economic and cultural development of remote and disadvantaged people. Raleigh allied with a local partner, Goreto Gorkha, which works with rural communities to identify needs, and then accompanies Raleigh in Nepal to complete community assessments before starting a project in the specific community. This summer, several volunteer groups were deployed in villages situated in the Gorkha district, in the North East of Nepal. The Gorkha district is the area that that was the most damaged by the earthquakes in 2015.